Wrestling superstar Paige wasn’t always wrestling superstar Paige. She started out as Saraya-Jade Bevis, the youngest of a family of small-time professional wrestlers in England. When Saraya and her brother Zak get a chance to audition for roles in the WWE, they leap at the opportunity – but when Saraya alone gets picked up, her ascent as “Paige” causes rifts within an envious family. Telling the true story of the youngest-ever WWE Divas Champion, Fighting With My Family is a movie for wrestling fans and newcomers alike (not to mention fans of British cinema), exploring what makes wrestlers tick. Starring BAFTA nominee Florence Pugh (Lady Macbeth) as Paige and Jack Lowden (Dunkirk, Mary Queen of Scots) as Zak, with support from Vince Vaughn, Nick Frost, Lena Headey, and of course co-producer Dwayne Johnson, it’s a passionate journey behind the scenes of the WWE. 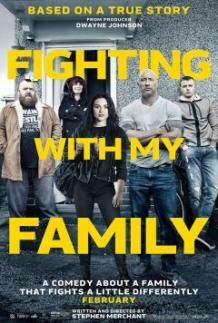 Written and directed by The Office’s Stephen Merchant, and based on a 2012 documentary by the same name, Fighting With My Family is a heartwarming comedy about wrestling, relatives, and redemption. Its brother-sister rivalry is just as incendiary as those in the ring, proving the toughest struggles are with those closest to you.